A Medical Family truly dedicated to providing Family Medicine for your Family. Our patients' health is our number one priority. Dr. B.C. 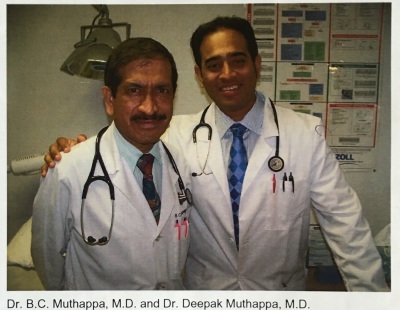 Muthappa started practice as a general surgeon in Clarksville Texas in 1977. Since that time he has built his practice with the sole mission to provide the best quality healthcare possible. His son, Dr. Deepak Muthappa has now joined his father and is practicing full scope Family Practice, including Pediatrics, Geriatrics, Minor Surgery, Cosmetic Dermatology, Pain Managment, Migraine Managment, and Psychiatry. Thier endevour is to bring true Primary Care Medicine to Northeast Texas and to become thier patient's families Primary Care Provider. B.C. Muthappa MD has over 45 years of experience. Deepak Muthappa MD has 7 years of experience. Both strive to practice the latest evidence based medicine and use the latest technology to improve the quality of health care provided. 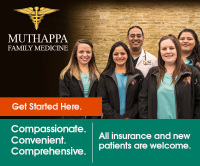 Muthappa Family Medicine currently has two clinics: the original and recently expanded office in Clarksville, and the newly opening clinic in Paris. Both offices will be open Monday - Friday, 8 am to 5 pm. They accept all medical insurance providers. Clincal lab draws, evaluations, and spot testing are provided at both locations. Walk-ins are welcome, though scheduling an appointment is preferred as it will reduce your wait time. This website makes it easy for you to gain access to creating your patient profile, updating information such as medical history, problem list, and medications, and schedule appointments. Once you have created a profile, you will also have access to the patient portal, which gives the patient the power to request refills on medications, coordinate appointments for labs and office visits, and contact your provider. This website also has a host of useful pages covering a wide range of commmon medical issues along with links to other important medical service websites. Advance Medical Record and Patient Access Portal Giving Patients control of thier healthcare!